Plant Protein: A Nutrition Q&A About Plant Protein - OhMyVeggies! Today, I’m here to tackle some of the most common questions asked relating to protein and a plant-based diet. While there are differences in these diets, the foundation of all of them is the same: fruits and vegetables, whole grains (or gluten-free grains), healthy fats, and plenty of water. People say that vegetarians can’t get enough protein in their diets because they don’t eat meat. Is this true? No … and yes. Let’s start off with the first part of this answer, no. Vegetarian diets, and even vegan diets which are a bit more restrictive, can contain more than enough plant protein for your body to thrive and for you to maintain a healthy, active lifestyle, as long as your diet is planned properly. One of the biggest problems I encounter with my clients who practice plant-based eating is the lack of overall protein in their diet, including plant protein sources. Getting adequate amounts of plant protein is extremely important as protein is the building block of our cells, muscles, tissues, and so much more. Protein plays many roles in the human body; it’s responsible for a myriad of functions, including transportation and storage, as a structural component (collagen, muscle tissues, etc. ), messengers (hormones, etc. ), enzymes, and antibodies. Protein should be high priority in all diets, but especially in plant-based ones. Making sure you have enough protein throughout the day is key to long-term success. My tip is to make sure you include a vegetarian plant protein source at every meal–this will help round out your overall intake of amino acids throughout the day (which are the building blocks of protein). Check out the Academy of Nutrition and Dietetics position paper on vegetarian diets for ideas on what to eat in order to ensure you’re taking in sufficient amounts of protein and other often-overlooked nutrients. If your diet is not strictly plant-based, you can include other sources of protein: 1 whole egg provides 6g of protein (an egg white is 4g), and dairy products have varying amounts of protein. Also note, many vegetables, carbohydrates, and some fruits naturally contain trace amounts of protein as well (2-5g per serving, depending on the food). These shouldn’t be considered reliable sources of protein unless you’re eating incredibly large amounts of them. How much protein should I be getting every day? This is a great question, with many answers. It depends on your lifestyle, goals, digestion, diet, etc. In general, 0.8g of protein per kg of your bodyweight is the recommended daily allowance (RDA) guideline recommended by the Academy of Nutrition and Dietetics. I would actually go a bit higher, as vegetarian and vegan proteins are digested a bit differently and are not as bioavailable as animal proteins. For example, a 140lb woman would need: 140lbs / 2.2 (conversion from lbs. to kg) = 64kg. 64kg x 0.8g protein = 51g of protein per day. Let’s say this female was eating 2000 calories/day, protein would make up roughly 10% of her intake–this is fairly low in my opinion. Again I highly recommend meeting with a qualified practitioner or Registered Dietitian who can set specific protein ranges for your lifestyle and goals (if you’d like to work with me, I offer Nutrition & Health Coaching through my website). Is it true that vegetarians have to combine certain foods in order to absorb protein? No. Combining vegetarian proteins to make a “complete protein” or “complementary protein” is a theory of the past. We now know that our bodies store amino acids (i.e. the building blocks of protein), and they can be utilized to make up for any limiting amino acid in a vegetarian food. It is important however to consume a wide variety of vegetarian proteins and foods rich in nutrients throughout the entire day, but it doesn’t have to necessarily be in the same meal. On the other hand, some foods, like those rich in vitamin C, do help your body absorb the plant-based iron sources (non-heme iron)–for example, think of eating red bell peppers with beans or an orange with nuts or seeds. Should I be adding protein powder to my diet? Possibly. If you’re an athlete, active, or engaging in fitness training it may be a smart idea to supplement your diet with good quality vegetarian based proteins to make up for your demanding needs. Notice the word supplement–this is not meant to be the bulk of your protein intake. Protein powders are used to supplement (i.e. make up the deficit in) the diet overall. Even if you’re not very active, protein powder still may be a great option to incorporate into your diet to make sure you’re meeting your needs. There are many quality brands out there that can easily be mixed in with water, almond milk, coconut milk, smoothies, etc. Vega , Sunwarrior , Garden of Life Raw Protein , PlantFusion , and Perfect Fit are some of my current favorites. 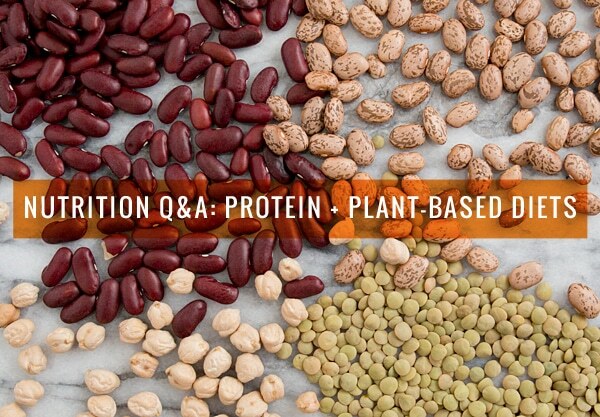 I hope that answers some of your initial questions about plant-based protein. I want to hear from you: do you still have questions about plant protein, minerals, or overall nutrition in a plant-based diet? Post your questions below so I can address them in an upcoming post! Thank you for the helpful info McKel! I took a nutrition course at my university last year and was taught about complete or complementary proteins. I was considering trying out a vegetarian diet for a week or so just to see how I feel with it, but I felt overwhelmed by having to plan out all my meals in a way that adhered to the recommended food combinations to get complete protein. Perhaps I’ll have another go at it now. Thanks! 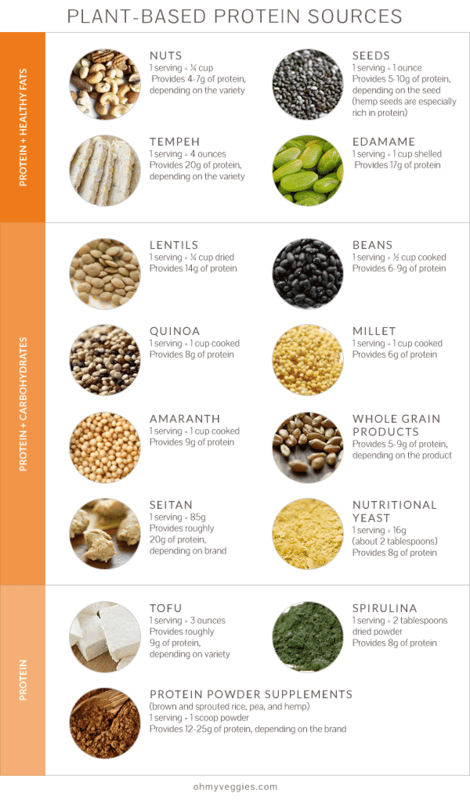 I’m glad this resource has helped shed some light on protein sources. If you ever need additional guidance I’d be more than happy to help you out with a consultation. Feel free to email me! what do you think of bee pollen as an added source of protein/minerals? Thanks! Thank you for such an informative post McKel! I Often forget about my daily protein intake. Thanks for the info! You’re very welcome, glad you enjoy! Check out Ginny Messina’s: the vegan RD. Ginny is a registered dietician . Great post! I had read several other places that it is no longer necessary to “combine” proteins or eat complementary proteins at the same meal but, that over a course of a day, you should try and eat a wide variety of foods to insure you are getting all the essential amino acids. Is that a correct understanding? Thanks! This is a fabulous and very helpful post to help us explain how we veg-heads get our protein. I sent it out on Twitter and posted it on my Pinterest board. Wonderful, thank you Letty! I’m glad you enjoyed it! The first reaction I get from people when I tell them I’m veg is “what do you eat for protein”…it’s crazy! In general, I think people believe they need to eat way more protein than they actually do. But with greek yogurt, beans, and eggs at my fingertips…I feel like I get more than enough! Super helpful post! Thanks you so much! I’m glad you enjoyed the post Martina! Yes myfitnesspal.com can definitely be useful in determining and staying on track once you know how much protein you should be consuming a day based on your needs! This post is such a great resource! I know I need to up my protein intake, so this will help immensely! Thanks for this; even after 11 years of being a vegetarian and one of vegan, I still forget to get my protein in! This simple breakdown is great, and will be on my fridge door tonight! Really well thought out post, madame! Thanks for sharing. This guide is incredible! I’ve bookmarked it for future reference. Love the graphic too, really helpful and easy-to-follow. I also like that you emphasized that protein powders are supplemental additions, I think that’s really important info for all vegetarians and vegans -food first! Thank you for this post! I just realised that though I’m thoroughly enjoying being a vegetarian and I love all the above, I need to be incorporating a lot more to get the protein I need. I reviewed the paper you posted from the Academy of Nutrition and Diabetics. This is what it states regarding B-12 vitamin, which is vital for neurologic function. sources of vitamin B-12 (12,46,47). What do you make of this peer reviewed evidence that a vegetarian diet has to be supplemented with vitamins to be healthy? I’m not sure where you’re getting the evidence that a vegetarian diet has to be supplemented – from your own quote, it says “Lacto-ovo-vegetarians can obtain adequate vitamin B-12 from dairy foods, eggs, or other reliable vitamin B-12 sources (fortified foods and supplements), if regularly consumed.” It’s vegan diets that require supplementation, not vegetarian. Fantastic summary of this ongoing debate! Many people are stuck on the “how much protein” and “do I need to combine”. Thanks for this great post, great tool to pass along to clients! Super in-depth – thanks so much. We’re always trying to educate people about vegan proteins at Urban Vegan and just how easy they are to get on a vegan diet. Glad to see others doing the same!!! P.S – love the site. Hi Virginia, plant-based diets definitely include oil and healthy fats. Some people choose oil-free diets for various reasons, but that has nothing to do with vegetarianism. I think your answer regarding protein powder is spot on. It’s nice and convenient, and really useful for an athlete trying to consume a large amount of protein, but if possible, beans, lentils, and other unprocessed sources are better. Simple and to the point! This article will solve many misconceptions for new plant-based explorers.